I have mixed feelings about how the film is so heavily emphasised as Miyazaki’s swansong. Not because I think he’ll return to the helm, as he did after Mononoke-hime, but because he’ll still be a dominant force in the studio and even if he only writes rather than directs, the likes of Porco Rosso 2 are going to be very close to being ‘Miyazaki films’. But aside from that, I am very happy that Miyazaki got to make this film. It’s the love story to flight that he’s hinted at his whole career, and it’s clearly in many ways autobiographical despite being ostensibly about historical figure Horikoshi Jiro. It’s also easily his most sophisticated and straightforward film as a director, the one time that he has been more Takahata than Miyazaki, more Ozu than Kurosawa, and that is something that I’m very pleased he proved he could do before the end of his career. Thus, the fantasy here is limited, more along the lines of magical realism than in the rest of his oeuvre, and the historical setting is key rather than something distant and whimsical. For the first time, he writes about the second world war, and how disastrous it was for Japan – even hinting at the taboo subject of Japan’s conduct in China. The Bomb looms just off the page, and it is very interesting to remember that at one point not so long ago Japan wasn’t leading the world in technology, but scrambling to catch up. Accordingly, the film has been Miyazaki’s most controversial, politically. It’s only right that the war enters this picture, though. At the heart of Miyazaki’s evaluation of Horikoshi is that the weaponization of planes, while what provided his funding, stunted his creativity and stood in the way of his genius. Of course, this is a nice, idealised angle – as critics have pointed out, leaving out much of the darker side of Mitsubishi’s wartime production – but then, this is like so many of Miyazaki’s films centred on the changing world and nostalgia for what is lost. The things that he portrays of his engineering hero make sense, and the film makes no claims of historical accuracy. Hiroshiki from early childhood has a series of visionary, consistent, often prophetic visions, many of them involving his hero, Giovanni Caproni – who apparently believes the Japanese boy is appearing in his dreams. Inspired to become a flight engineer, he studies at Tokyo University and meets a lovely young rich girl by chance during an earthquake. 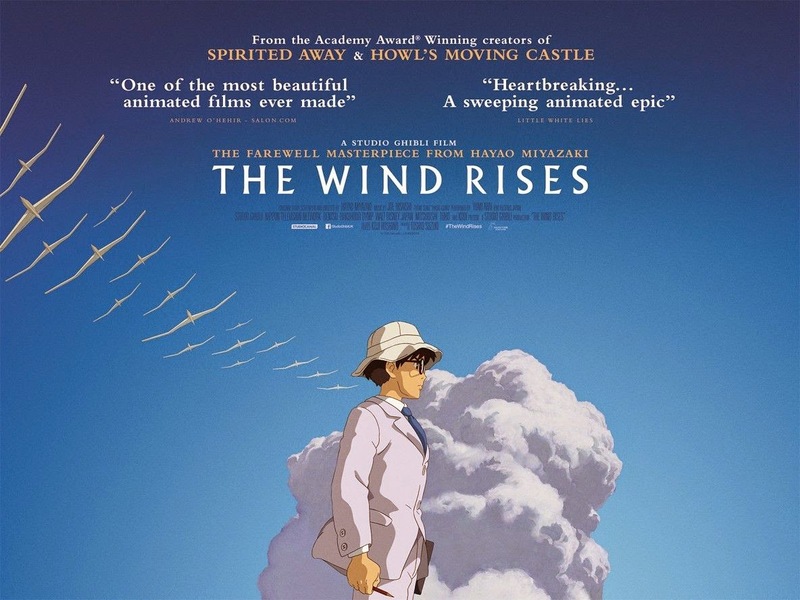 Though I thought there would be a touch of genius about having a story of Horikoshi narrowly missing out on love all through the narrative, but the fairytale romance Miyazaki gives us is also fascinating, gives some of his most beautiful imagery in the wedding scenes, and gives a bit more narrative structure to what is after all a film that lacks drive. The subtle meditation on the divided loyalties of a man devoted to both his work and his wife, as well as the sacrifices a woman can make, clearly have a lot to do with Miyazaki’s own thoughts on his home life, and make for some very interesting ambiguity. Though the idea is taken from the novel on which the film is loosely based, the film also has scenes in a sanatorium based on the one in Thomas Mann’s The Magic Mountain, and its protagonist appears as an eccentric but loveable foreigner with a huge nose and very broken Japanese – performed by former Ghibli board of directors member Steve Alpert. There’s similar casting dynamics at play in the casting of Horikoshi himself – he is played by Evangelion mastermind and Nausicäa wunderkind Anno Hideaki. This is quite a strange choice – the things Jiro is most recognisable for here are his glasses and his odd nasal voice. While Anno’s performance was jarring at first, something about his unpolished performance actually worked very nicely – it seemed natural and awkward in an appropriate way. Technically, the film was a triumph. Those flight sequences he does so well are of course to the fore here, and the technical elements are beautifully-done. The characters look great – and some of the more comic seem more like something out of Ghiblies than the usual films, though never so much so that they seem out-of-place. The sound effects are often done by voices, like a more refined version of Yadosagashi, which felt nicely like it had almost been a personal preparation for me. It’s strange and otherworldly, being a little odd when it comes outside of fantasy sequences, but I think it works well. The choice of music is also a good touch. This isn’t a film for everyone – the audience will likely be a lot smaller than that for Spirited Away or even Howl’s Moving Castle. Not everyone will want to sit through it, and it’s much more arthouse. But it is also assured, moving and quite brilliant. A real gem in an already world-class career.